Easy, if those 13 miles are between Imperial Highway and Getty Center Drive. 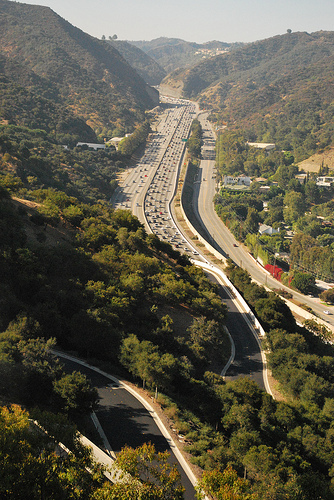 A new study on the nation’s traffic corridors ranks that stretch of the 405 as the most congested in 2011. Ah, but it also says L.A. in general is no longer number one in traffic congestion. Want to know who is? The Southern California Association of Governments (SCAG) has adopted a Regional Transportation Plan. What’s significant about this and why should we care? Metro Board and Santa Monica City Council member Pam O’Connor explains. L.A. Times photographer Francine Orr has posted a collection of images shot from the window of the Gold Line and they’re alternately sweet, real and occasionally beautiful in the pretty sense. They’re a good reminder of how complex and compelling our incredible city is. Dense and smoky spareribs at J N J Burger & Bar-B-Q; spicy hot links ladled with beef chili, chopped onions and strands of melted cheese at Earlez Grille and sizzling hush puppies and fish from Mel’s Fish Shack. Do we have your attention? They’re all along the Expo Line and among dishes mentioned in a dining review in the LA Weekly. Going from one place to another and back on the Expo Line will cost a transit rider $3.00 for a roundtrip price, all for a measly 2.7 miles worth of transit. Logically, most people will just walk, skateboard, bicycle, Segway, moped, and most definitely just drive if it’s just 2.7 miles between these two restaurants. Not worth the $3.00 roundtrip cost per person on public transit to get a measly 2.7 miles. And if people are going to a restaurant, they’ll be going as a family or with others. That means dividing the cost of driving shared with other people in the car, it’s even much more cheaper to drive the 2.7 miles distance between the two. No group is going to pay $3.00 per person to travel 2.7 miles when they can all just hop in a car and go. “Meh, it’s so close, let’s all take the Corolla, and I’ll drive,” simple as that. Oh and guess what, yes it is cheaper to drive a car between these two places, because Metro’s Trip Planner doesn’t even show a AAA comparison price to get from Fairfax/Adams to Crenshaw/Exposition. What a shocker. BTW, to get from J N J Burger (Fairfax/Adams) to Earlez Grille (Crenshaw/Expo), can be done on the Metro Bus 38. This is from Metro’s own trip planner. A whopping 9 minutes of travel time, not counting the time waiting for the bus, that covers 2.7 miles of transit, and be ripped off $3.00 for that roundtrip price. Or, people will just bicycle or just drive that 2.7 miles. And Metro wonders why they’re not gathering any support from the short distance ridership market. Brilliant how my taxes are put to use, eh? You’re right, group of 4 friends sharing a car comes out way cheaper at this short distance. Even driving alone still comes to $1.08 in gas roundtrip which is much more cheaper than the $3.00 roundtrip cost to ride Metro. No wonder people still drive their cars; it’s still cheaper to drive shorter distances than taking the bus! Speaking of SCAG — they’re currently studying alternatives for the PEROW / West Santa Ana Branch Corridor, which does have some funding from Measure R. The study/meetings have been in the news quite a bit this week. In my opinion, this project should absolutely be built as light rail and tie into the LA Meteo system. If possible, OCTA can subsidize it for the portion in OC. I go into detail on the alternatives here http://steven-white.com/2012/05/23/the-next-orange-line/ but I think that Metro should certainly be the operating agency and that it needs to tie into the current system. Metro’s current ridership is made up of people that travel over longer distances. With Metro discouraging shorter trips, it impacts the circulation of transit riders with frequent boardings and alightings. Because of this, the bus is always crowded, leaving those that want to ride the bus at certain bus stops along the route to get passed up by bus drivers because no one is getting off to make room. Metro needs to seriously look at the needs of those that have shorter commutes if they’re serious about moving people over to mass transit. People that have shorter commutes are tax payers too. We deserve a fairer fare structure.